The proposal for a new key spacing=* receives both positive and negative comments on the tagging mailing list. In Italy getting children to school in accompanied groups (‘walking buses’) is organised to the point there schedules are posted on poles along the route. On the Tagging mailing list there is a proposal to tag these in a similar way to bus stops, as a sort of public transport without a vehicle. Bryan Housel, the maintainer of the iD editor, explains on the tagging mailing list, why iD introduced, via the preset mechanism, new undocumented tags related to vehicle servicing. The topic did not generate a lot of interest on the mailing list, and a question as to whether other tags have been introduced in this way remains unanswered. A Reddit user compares the frequency of ground-level parking in the downtowns of 50 US cities making use of OSM data. You are invited to add your nominations to the OpenStreetMap Awards 2018 – the call for nominees will close on 31th of May. HOT welcomes this year’s Google Summer of Code (GSoC) students and Outreachy participants. Note that HOT’s participation in GSoC this year is distinct from that directly under the OSM name (See below). Official Danish government address data was first imported to OSM in 2009. Now a new web app AutoAWS for automatically maintaining address nodes within Denmark is under development. First live test runs have been performed. A German instance of uMap is planned to relieve the French servers. An application for funding to make this possible was submitted to FOSSGIS e.V. The OpenActive team from the Open Data Institute (ODI) seeks people to interview from OSM or OSMF as part of a study on open data for sport and physical activity. State of the Map Asia 2018 will take place in Bengaluru, India, on November 17th – 18th at the Indian Institute of Management, Bangalore. The call for scholarships is closed and the Call for Proposals closes on 10th June. The organisers of State of the Map 2018 in Milan, Italy invite attendees to the social event on the night of Saturday, July 28th. OSM US invites you to the hackathon in the Mapbox offices of Washington, DC, on May 21st and 22nd. In Somalia, 500,000 people are affected by severe flooding. HOT is looking for mappers to help. HOT has received a donation from the Digital Impact Alliance (DIA). Interested open source projects can also apply for funding by 31 May. The HOT Training working group will be hosting the May HOT Community Webinar on Monday, May 21st, 14:00 UTC and it will be focused on learning to use JOSM. 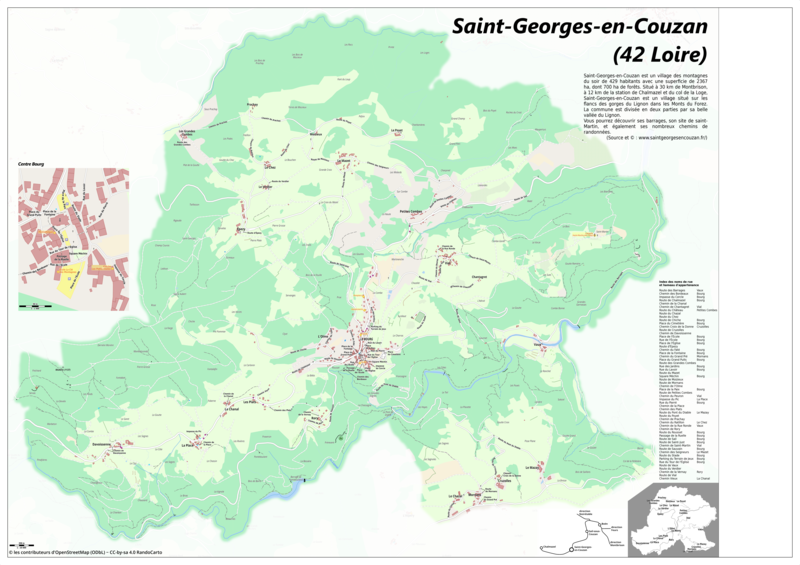 JB used Maperitive to create a map of a village in France. He shares the code used to accomplish this on GitHub. Joe Matazzoni, product manager of the Wikimedia Foundation, introduces the planned innovations on the Wikipedia maps in the framework of the Map Improvements 2018. In order to better support the Bike to Work initiative, the Canadian advocacy group Bike Ottawa created a platform that helps cyclists with planning safe routes. The data comes from OSM, as they provide speed limits, street widths, and the presence of bike lanes, which is useful to measure the traffic stress level. Mapframe templates are now available in Wikipedia. OpenStreetMap is used on the information screens of the Irish bus company Bus Eireann and on a public bus in Malaga, Spain as well. Starting June 11 both an API key and payment details will be required to use Google Maps’ services. Prices for many users are likely to increase, in some cases sustantially. See the entry on the Google Maps blog and the alternative view of the subject on geoawesomeness.com. Ilya Zverev’s OSM Conflator import tool – which is used for the NavAds gas station import – suggests users can use Google Street View for validation. An issue has been raised with the DWG as this seems contrary to existing policies. Assetto Corsa, a sim racing game, now generates track layout and street scenery from OSM. We received 7 slots for students to work on OpenStreetMap related projects for Google Summer of Code 2018. The OSM Carto style developers discuss how a style comparable to OSM Carto using vector tiles might be implemented. On the OpenTopoMap, the names of lakes are marked along the path of the centre line of the longest loops. This results in a very professional map. User maxbe explains the algorithm used by the renderer to determine this line from the shore. Looking for latest updates? Please check the OSM-Software-Watchlist. … the Top Ten Tasks wikipage? Ollie O’Brien writes about maps of ground deformation in London caused by the construction of Crossrail. The data were collected using a type of Synthetic Aperture Radar: InSAR. Levente Juhász is seeking help for his PhD research about geo-social media and mapping platforms. He studies people’s online behavior from a geospatial point of view. More info on how to help can be found on his website. An article at Sitepoint shows how to build indoor office maps using WRLD, QGIS and OSM. The longest land and sea routes on earth are discussed in an article in Der Spiegel. Small multiples visualisation of drive time analysis worked up as 3D corals. This weeklyOSM was produced by Anne Ghisla, Nakaner, PierZen, Polyglot, Rogehm, SK53, Spanholz, YoViajo, derFred, doktorpixel14, jinalfoflia, keithonearth.